It is absolutely incredible that almost half of the people in the United States are so stupid that they voted for Donald Trump who Lies with Impunity, Exhibits Traits of Narcissistic Personality Disorder, is one of the biggest braggarts, Has no Humility, Rarely Apologies, Insults & Engages in Character Assassinations of Opponents, Praises Dictators, is for Passing Anti-Woman’s Choice Laws & Will Appoint Anti-Choice Justices in the Supreme Court, Wants to Limit Freedom of Speech. Is a Threat to the 1st. Amendment & Democracy, Sues People Who Speaks Out Against Him to Silence & Harass them and so much more. Donald Trump has ran the most hateful, mean spirited election in the history of the United States. A reasonable person would reject his hateful rhetoric and lies. But they sure are tools… Enough is enough, Trump supporters. We’re done! America has had enough of you. As Hillary Clinton said, “¡Basta!” You refuse to listen to reason, you refuse to absorb any actual facts, and the low-information voter routine got old well before it even began. Financial reports released by the Trump administration indicate that 27 staffers who work for him are worth a combined $2.3 billion thanks to real estate, investments and hefty salaries. How much is $2.3 billion? Here’s one way to look at it. The historian Rick Shenkman is editor and publisher of the indispensable website History News Network. I’m a fan and recently had the pleasure of reading his latest book, Political Animals: How Our Stone-age Brain Gets in the Way of Smart Politics . It’s been stunning to watch this election season going back to last July when Donald Trump entered the race. Many people (myself included) laughed. There wasn’t anybody who took him seriously or thought he had a shot (Yeah that includes you, Joe Scarborough). He was a joke and his mouth was going to end his campaign fast. Sixty percent of Republican presidential front-runner Donald Trump’s supporters believe President Barack Obama is Muslim and only 6 percent believe he is Christian, according to a new poll. Nearly three-quarters of Democratic front-runner Hillary Clinton’s supporters correctly identify Obama as a Christian while 5 percent believe he is Muslim, the poll by Zogby Analytics, a nonpartisan research firm based in upstate New York, found. Trump supporters are so stupid that they voted for an idiot who cannot give detailed answers as to what he would do to fix any problem he’s asked about. Research finds that children with low intelligence are more likely to hold prejudiced attitudes as adults. These findings point to a vicious cycle, according to lead researcher Gordon Hodson, a psychologist at Brock University in Ontario. Low-intelligence adults tend to gravitate toward socially conservative ideologies, the study found. Those ideologies, in turn, stress hierarchy and resistance to change, attitudes that can contribute to prejudice. There’s no gentle way to put it: People who give in to racism and prejudice may simply be dumb, according to a new study that is bound to stir public controversy. The research finds that children with low intelligence are more likely to hold prejudiced attitudes as adults. Politicians running for president are graded by Politfact and the order runs in the way you would expect it to if you find yourself annoyed when Donald Trump is speaking. Donald Trump, the Republican front-runner, is at the bottom of the list with a sad 9% of true or mostly true statements. CNN’s Brian Stelter calls Donald Trump a “uniquely fact-challenged candidate,” which is a prelude to introducing Daniel Dale, Washington correspondent for the Toronto Star, who fact checks every single word Trump utters and tallies them up for his paper. As you can see from the list above, Republicans has done tremendous damage to the United States and the American people. 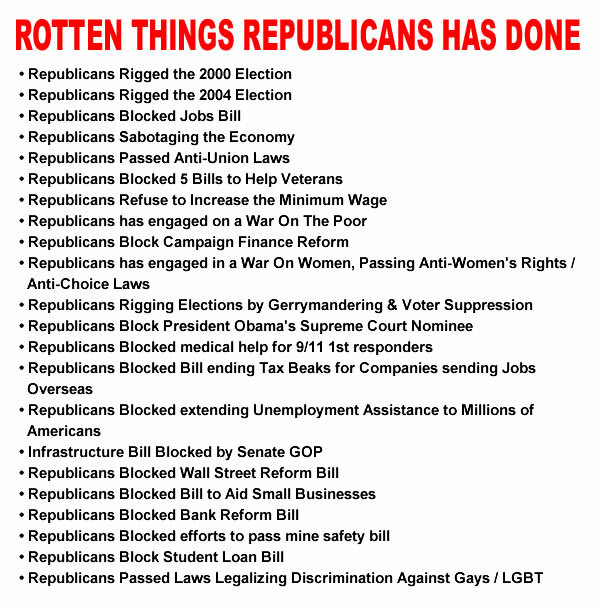 Stupid people who are voting for Trump and Republicans must not be aware of all the rotten things Republicans has done against them and the United States.